A renovation is one of the big dreams of many homeowners. People who have lived in their homes for years but always wanted to make it special and unique to their tastes have big plans and are excited when the time finally arrives to make their house more functional and beautiful. But people who have children have an extra hurdle that they must overcome. 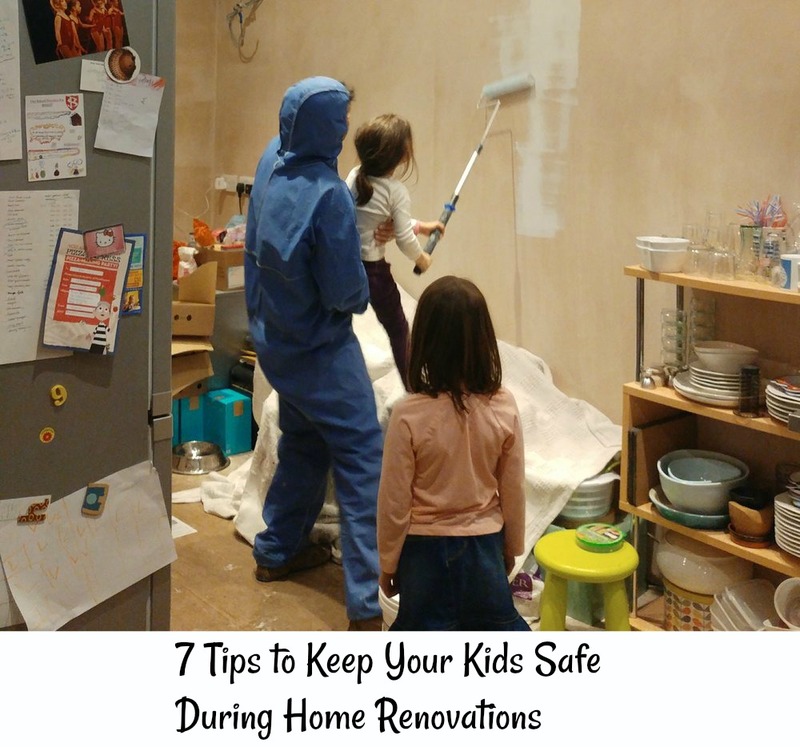 How do people keep the kids safe when renovations are in full swing? Whether you’re tearing out walls and floors or adding in cabinets in the kitchen, there’s going to be a lot of debris, nails, and other sharp objects that children could hurt themselves on. If you’re one of the many homeowners with children who are renovating their houses, you need to have a plan to keep the kids out of the way so that they don’t get hurt and the contractors can do their jobs. Here are a couple of tips to make sure that your kids stay safe. One of the best ways to keep toddlers and other young children away from construction areas is to put up baby gates. While you might need to have a path where construction workers can come through without being hampered by obstacles, if you have toddlers or children who can’t yet follow directions, a physical barrier between the room that’s under construction and the room that the child is in will give you peace of mind. If you have children who are in primary school, they are more likely to be able to listen to directions and follow them. Explain to children that there are sharp objects in the room that they could hurt themselves on. You should also let them know that the people who are working on the room need room to work. When you’re having projects done on the house and children will be around, make sure that you give kids other safe places to play. For the weekends, you can even come up with some activities to keep them entertained and less concerned with what the contractors are doing. Children are inquisitive, and they want to know what’s going on. One of the best ways to keep them out of the way is to keep them distracted by even more fun things to do. If a lot of your renovations are being done on the weekend, see if a friend or family member is willing to take them to the park. You can also ask older children to play games in their rooms. If you’re hiring contractors, you should expect them to do some minimal cleaning so that the area is safe. There might be some pieces of equipment that they have to leave behind, but it’s reasonable to expect some basic cleaning, such as sweeping and putting tools away, to be done by the contractor. If you’re doing the project yourself, make sure that all tools are put away at the end of the day. When you’re doing major demolition, dust will fly into the air. Make sure that you know what’s in the dust. It might not be at the forefront of your mind, but some dust can have long-term health consequences, especially if your house is more than a few decades old. Asbestos and lead paint are significant concerns. If you want your house to be safe for your children, you need to learn what’s behind the walls. Talk to the contractor to find out what might be there. They might not know until they open the walls, but they can cut into a small portion to see. From there, you can decide on how you’ll keep your children away during the demolition process. If you’re stripping the floors, make sure that you hire a reputable company, such as Absolute Floor Stripping, to complete it for you. They’ll have the know-how to complete the home renovation while minimizing the number of fumes that your children are exposed to. You will also be able to plan as to how you’ll purify the air when the demolition phase is finished. Be sure to pick contractors that are certified to perform the work. You can also ask around with friends and family to find the contractor that will be able to fulfill your basic needs. Contractors with experience will know what’s in your walls, and they might even be able to make suggestions on how you’ll find alternative spaces for keeping the kids out of the way. Contractors with positive reputations will also be more likely to clean up after themselves at the end of the day. If you’re renovating the kitchen, you’ll need another place to put the refrigerator, microwave, and some snacks. Children, teenagers, and even adults want to be able to grab a snack. It’s a legitimate concern. How are you going to satisfy your children’s hunger pains that arrive right in the middle of construction? You can move the refrigerator, microwave, and a few other essentials to the living room, basement, garage, or anywhere else it’s likely to fit. Just make sure that you choose a room that is far away from the kitchen so that you and your family aren’t eating dust. If the bathroom is under construction, hopefully you have at least one more option. Make sure that your contractor understands that the bathroom renovations need to be completed on separate timelines. You’ll also have to figure out a different bathing schedule so that everyone can get to work and school on time. Making sure that your children are healthy and safe when you’re renovating your house should be at the top of your concerns. Hire the right contractors and make plans around the work area so that your kids are taken care of when the contractors are there.